Aspen A Plus Executive Transportation offers on-time and affordable San Francisco International Airport Sedan Service & Private Car Services. We are conveinetly located just a few miles from the SFO airport and legally operate our vehicles at the airport. Our chauffeur will meet you at the airport or your hotel and take you to your destination on-time and in total comfort. 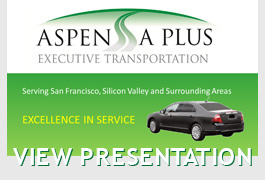 You will find Aspen A Plus Executive Transportation sedans to be clean and well taken care of. Our SFO Sedan Services are a perfect way to travel to or from the San Francisco International Airport for individual travelers, corporate clients or famiies. Aspen A Plus Execuitive Transportation San Francisco International Airport Sedan Service is the affordable way to travel. Our private chauffeured airport transportation services will have you and your guests traveling in one of our corporate vehicles. Choose between our Executive Lincoln Town Cars, Lexus LS 460 Executive Sedans, Hybrid L Fusion Livery Sedans, or our BMW 750li Executive Sedans. For mid sized groups we offer our San Francisco International Airport SUV Services. 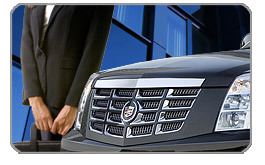 We operate a full line of Cadillac Escalade ESV SUV's, Chevy Suburban SUV's, and Expedition EL SUV's. View our Fleet Gallery. Our (SFO) Mercedes Sprinter Executive Shuttle Service is perfect for corporate travelers and small groups. We have direct access to the SFO Airport and our chauffeur can pick your group up and help with your luggage. Our executive black Mercedes-Benz Sprinter offers total comfort and dependability. Amenities include: Executive Black exterior, black leather interior with AM/FM/CD/DVD stereo, rear luggage storage and more.